RocketTheme have only gone and done it again! This time they've taken quite possibly the most popular RocketTheme theme and actually made it better! 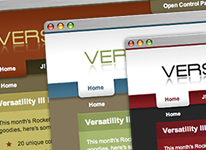 Versatility III is not only an update to an already legendary theme but you have a brand new, available only to RocketTheme members, menu system called RokMooMenu, 20 colour variations, 16 fully collapsible module positions and 8 Hilite module styles. Now, it's really simple. Click here and sign up to RocketTheme. Not only do you get this theme, which is actually worth the subscription fee, but you get access to forty other themes and at least one more new one per month! Or you could click here for a demo.